Hi. I’m new to Blocs and loving it so far. However, I am having an issue where after about 15 minutes using blocs, it slows right down to being almost un-usable. 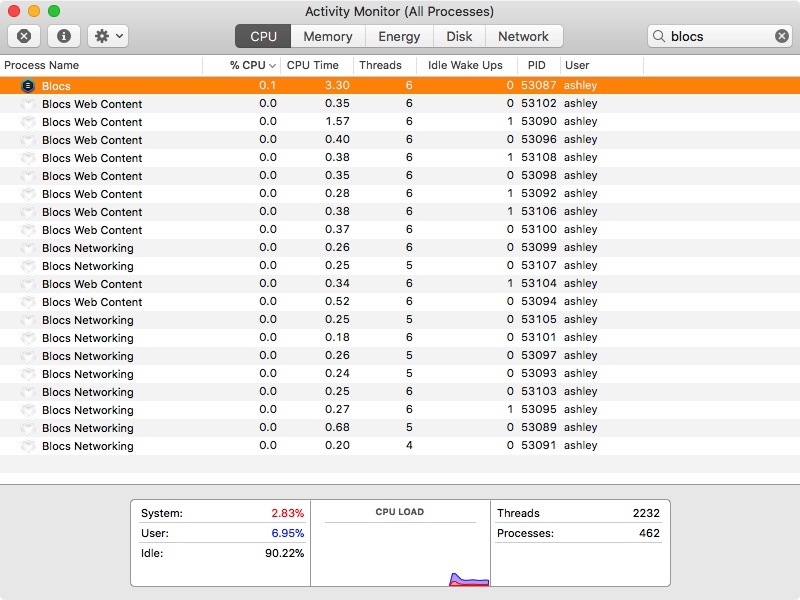 I look at my activity monitor and it tells me that Blocs is using about 12% cpu, but ‘blocs web content’ is using 99.8% cpu. I presume this is part of the problem. I am using a macbook pro which is less than 2 years old, running 10.12.3 and blocs is v2.5.0. Almost nothing else is running on my machine. Anyone with any ideas on what I can do to get moving again? Hi Matt, welcome aboard. Haven’t seen anything like this, though my machine is not happy when HD space gets very low. Hopefully Norm will have an idea. This doesn’t sound right; I can run Blocs day and night with no slowdown in performance, whether on the Mac Pro or an ancient 2007 iMac. The Mac Pro is on High Sierra, but the old iMac is on El Capitan. I’ve just checked with the activity monitor and it barely registers. Here it’s showing 0.1% and an app like Maya can hit 1600% on this machine. It has occasionally become unresponsive with beta versions, but nothing in the activity monitor has ever suggested a problem and I never see spinning ball. Do you have big assets in your project? Or lots of pages? What age is your Mac. Flashman is right - it wasn’ right… I removed a few graphics applications I had installed recently and the problem disappeared. I am presuming there was a process conflict there somewhere - and actually nothing to do with Blocs at all as it is now working 100% perfectly. That’s really strange. 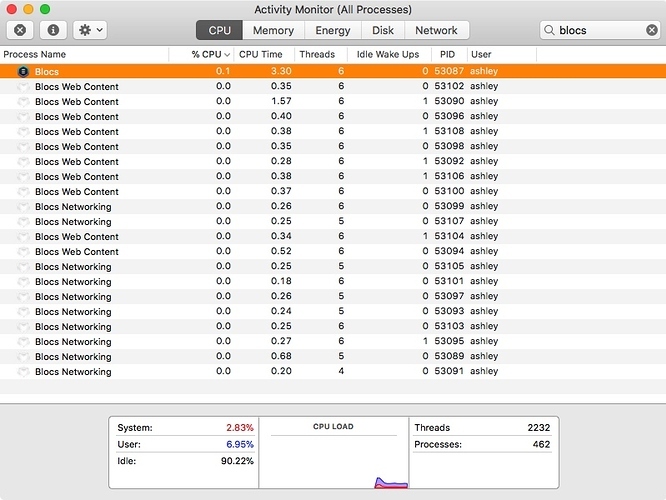 I’ve not heard of something like that before where one app influences the CPU usage of another. I thought Mac OS was supposed to isolate things like that.